Annie Treacy nee Corcoran, dispatch rider, Cumann na mBan North Roscommon Brigade. Christopher Tracey, 21 Caragh Road, Naas, Co. Kildare. E. Tracey, Capt & 2nd Lieut, Dublin? John Rupert Treacy, [Professor] of Youghal, County Cork, Limerick, Dublin and Sligo. Mary Tracey, 37 Westmuir Street Glasgow, Scotland. Nora Igoe, Mrs, [nee Treacy], Goff St. Roscommon. Thomas Tracey, 37 Westmuir Street Glasgow, Scotland. John Rupert Treacy, [Professor] of Youghal, County Cork, Dublin and Sligo. O Duibhir, Liam (2013) Prisoners of War: Ballykinlar Interment Camp 1920-1921. Mercier Press, Cork. Thomas Tracey & Mary Tracey, 37 Westmuir Street Glasgow, Scotland. Notes; File relates to successful Service (1917-1921) Medal application. Service certified and medal issued 15 January 1948. Notes File relates to unsuccessful Service (1917-1921) Medal application. Service not established and medal not awarded (1965). Subject claimed service as a dispatch rider in North Roscommon Brigade of Cumann na mBan. It was on the advice of Michael Collins that I took over a restaurant called the West End at 40 Parkgate Street, a few months after the arrival of the Black and Tans... I installed myself there and things turned out as expected. I had a Cumann na mBan assistant, Máire Gleeson, who is now dead, and another girl, Katie Tracy. They were both very reliable. Address: Aine Ni Riain, 25 Upper gardiner Street, Dublin. 'Jimmy Arnott' may have been James M Arnott 76589, a 19 year old from Kent. He joined in December 1920 and resigned a year later, he had been an engineer. He had worked in Motor Transport in the RIC. Miss Katie Tracey joined Cumann namBan in 1918 with the Geashill Branch. She had two brothers in the Vols. One brother was O.C. of despatches for the Brigade. She lived at Killarles, about a mile or two from Geashill. She had no sister in the Cumann na mBan. She lived with her parents on a farm. Probate...to Patrick White of Ballydownan Geashill in the county of Offaly, farmer, nephew of deceased the sole executor. File relates to Katie Tracey's receipt of a military service pension in respect of her service with Cumann na mBan in the service periods between 1 April 1920 and 31 March 1923 during the War of Independence, Truce Period and Civil War. Applicant also claimed unsuccessfully for service in all other periods between 1 April 1918 and 30 September 1923. According to Katie Tracey and her references, during the War of Independence she was heavily involved in despatch work, assisting with an arms dump and catering for IRA men. It is also stated that her house was used as a meeting place for IRA battalion and brigade officers and meetings. Her activities continued during the Truce Period and Civil War in support of the anti-Treaty IRA forces carrying despatches and assisting men on the run. She states that two of her brothers were also involved with the IRA, one of whom was Brigade Despatch Officer. File includes: material submitted and signed by Katie Tracey in support of her service pension application; handwritten and typed statements regarding subject's service signed by Patrick McElduff, Thomas Dunne, Sean McGuinness, Margaret B. Dunne, Patrick Egan, Thomas McDonald, James Brophy, Patrick Gorry T. D., Patrick Quinn and Michael Galvin; typed summary (2 pages) of sworn evidence given by Katie Tracey on 21 May 1941 before interviewing officers; handwritten notes relating to discussion held with Patrick Quinn regarding claimant's service; and material relating to the settlement and closure of Katie Tracey's service pension account following her death in 1992. Notes File relates to an unsuccessful application for Service (1917-1921) Medal. Service not established for the critical period. Subject claimed service with the Tipperary and Dublin Brigades of Cumman na mBan. One of the Cumann na mBan girls from Wicklow, Kathleen Treacy, whilst visiting me in the jail at Wicklow a couple of days after my transfer then, informed me that there was a gentleman going around the comity wearing a Fáinne and stating that he was an officer from General Headquarters. He informed them in Wicklow town that he was sent down from G.H.Q. to reorganize the county and convene a meeting, for the purpose of appointing somebody to replace me and take reprisals for my arrest. I immediately got suspicions, as I had never notified G.H.Q. of my arrest, nor had any notice of my arrest appeared in the press and I told her to let the lads outside know and be extra cautious. Notes: File relates to successful Service (1917-1921) Medal application. Service certified and medal issued 3 March 1952. Notes File relates to successful Service (1917-1921) Medal application. Service certified and medal issued 20 January 1947. 1941-43 Treacy, Charles, Ballinalee, Longford. A Company, 1 Battalion, Longford Brigade. Notes File relates to successful Service (1917-1921) Medal application. Service certified and duly awarded medal issued 4 February 1974. Subject claimed that he was arrested by the Black and Tans in April 1921 and interned at the Curragh Camp, county Kildare, until December 1921. Associated file DP55234: relates to subject's application for Special Allowance under the Army Pensions Acts in respect of illness, disability or infirmity. Allowance awarded in 1974. File contains correspondence, memoranda, social welfare reports and means assessments. Notes File relates to successful Service (1917-1921) Medal application. Service certified and duly awarded medal issued 19 December 1974. Associated file DP55396: relates to subject's application for Special Allowance under the Army Pensions Acts. Application refused (1975) as subject's yearly means was found to exceed the appropriate annual sum. Notes: File relates to successful application for Service (1917-1921) Medal. Service certified by Michael O'Connell, and medal issued 1947. Associated file DP14688 : File relates to successful application by subject for Special Allowance under the Army Pensions Act, in respect of ill health experienced by subject. File includes: medical reports, social welfare reports, signed statements regarding application for said allowance, reports regarding the means and level of income of subject and sanctions granting payment of allowance. In the early hours of Good Friday, 14 April 1922, anti-Treaty members of the IRA occupied the Four Courts in Dublin. Liam Duffy, a native of Monasterevin, was part of the garrison. During the War of Independence, Duffy had been an officer in G Company, 6th Battalion, Carlow Brigade. Others in the company at the time included Captain Paddy Martin, a former Kildare inter-county footballer, Lieutenant Kit [Christopher] Treacy and Lieutenant Peter Dunne, Monasterevin. ..."The following Irregulars, two of whom were in the 'dump' were arrested:- Christopher Treacy, Monasterevin..."
Kit Tracey was prominent in Monasterevan, while James Behan, Co. C. ever threw the weight of his influence on the side of the independence struggle in that district. Pension file relates to Elizabeth Tracey’s unsuccessful application under the Army Pensions Acts in respect of the death of her husband Christopher Tracey who died on 29 September 1923. Material relating to family closed. Death not deemed attributable to service. Regarding the formation of the Volunteers in Kiltrustan the other members of the company were Michael O'Connor section Frank leader John Rodgers, Matt McCormack, McHugh, Michael Fallon, Patrick Rodgers, Michael Warren, Martin McHugh, John Kelly, Tom Diffley, Peter Lynch, Frank Wynne, Columbo Treacy, Joe Curry, John Caslin, Tom Kelly, Paddy Flanagan, Mick Tiernan, Tom Caulfield, paddy Beirne, Pat Brennan, Peter Carlon, Luke Cox, Dan Sweeney, paddy Sweeney, Tom McHugo, Peter Melia, pat Moore, pat McCormack and Johnny Callaghan. Two young men named Con Treacy and William Carroll of Toomevara, have been fined £3 and £1 respectively...for using language likely to cause disaffection. The first military action taken in the Toomevara area by the Irish Volunteers was the shooting of two R.I.C. constables. named Rock and Healy in the village or the night of 16th March, 1920. I did not take part in this. There were only two men concerned in it, Paddy Whelehan and Jack Hackett. They shot both policemen dead and accidentally wounded another Volunteer, Con Treacy who happened to come within the range of the shots. Notes File relates to an incomplete/abandoned application for Service (1917-1921) Medal. Application unsuccessful; subject may have died before application process was complete. Subject claimed service with North Tipperary I.R.A. Application cancelled 4 May 1964. 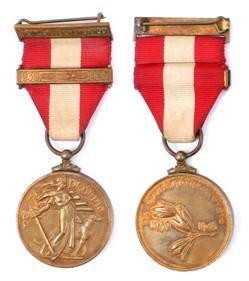 Notes: Service (1917-1921) Medal awarded. Notes: File relates to Service (1917-1921) Medal application. Incomplete application, no reply received from subject. Medal not awarded. Application submitted and written on behalf of subject by subject's son. Notes File relates to successful Service (1917-1921) Medal application. Service certified and medal issued 30 December 1952. Medal later deemed to have been duly awarded. Duly awarded certificate signed 2 June 1965. Application for Special Allowance made 28 April 1965. Associated file DP40658: relates to subject's application for Special Allowance under the Army Pensions Acts. Allowance awarded in 1965. After subject's death, balance of Special Allowance was paid to subject's widow Annie Treacy nee Hickey. Prosecution of Denis Treacy; possession of a shotgun without a permit; 1919; Ballyhorgan, County Kerry; to be tried by District Court Martial. WO 35: Piece 104/21: Prosecution of Denis Treacy of Ballyhorgan Co. Kerry. Character: This man is not connected with Sinn Fein organisation. He is a quiet country farmer who has never given any trouble to the police. Signed: James Regan, Constable, RIC. Notes: File relates to successful application for Service (1917-1921) Medal. Service certified and medal issued 26 August 1944. Notes File relates to successful Service (1917-1921) Medal application. Service certified and medal issued 30 December 1952. Medal later deemed to have been duly awarded. Duly awarded certificate signed 28 October 1966. Associated file DP43111: relates to subject's application for Special Allowance under the Army Pensions Acts. Allowance awarded in 1966. However, this allowance was ceased in 1975 due to an excess of means. Notes: File relates to successful Service (1917-1921) Medal application. Service certified and medal issued 10 August 1958. Medal later deemed to have been duly awarded. Duly awarded certificate signed 27 February 1958. Associated file DP20606 : : File relates to successful application by subject for Special Allowance under the Army Pensions Act, in respect of ill health experienced by subject. File includes: medical reports, social welfare reports, signed statements regarding application for said allowance, reports regarding the means and level of income of subject and sanctions granting payment of allowance. File contains copy of subject's marriage certificate (to Martha Fitzgerald, 16 January 1929). Notes File relates to successful Service (1917-1921) Medal application. Service certified and duly awarded medal issued 27 August 1960. ...Mr. Philip Shanahan...134 Foley Street, Dublin...They took Mr. Shanahan and his brother Michael Shanahan, and Edward Tracey, an assistant in the shop, into custody. Later in the day, Michael Shanahan and Edward Tracey were released. 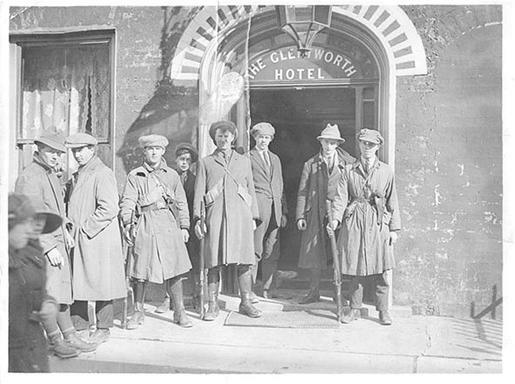 A meeting of the Kildare Brigade Old I.R.A. was held in the Courthouse Naas, on Sunday January, 12th 1936. Mr. Thomas Harris, T.D. ; Chairman, Presided and the following members were present; - Messrs. R. Harris, P. Dunne, M. Gardiff, P. McGee, T. Dunne, J. Dunne, P.Brennan, W Byrne, E. Treacey, A. Metcalfe, M. Ryan, J. Cullen, and M. Smyth Secretary. Statement showing the names of persons resident in the County of Kildare to whom pensions have been awarded under the Military Service Pensions Act, 1934 (including pensions in respect of service in Cumann na mBan) and the Grade and annual amount of pension in each case. ...Grange Company, under Martin Conway, raided Rockbarton House early in July, 1920...Edward Tracey... (See "Limerick's Fighting Story by me as "Seamus"). ...August 1920...Conway was Captain of Grange Company with Edward Tracey as 1st Lieutenant. Jerry Treacy, Nicker, Pallasgreen [see below]...The Brigade 0/C. East Limerick, insisted that as the car was taken in his area it should be handed over to him. This course was eventually agreed to and, about ten days later, Ned Treacy of Holycross arrived with a driver at my house and I went with them and handed over the car. ...October 1920...Éamonn Treacy...Lough Gur...and the Grange contingent under Martin Conway and Éamonn Treacy. Edmund Tracy of Fedamore Limerick, 04 Oct 1921 Internment camps & prisons, No. 89 was released from internment unconditionally on the 16/9/21. Army Pensions Acts. List of persons resident in Co. Limerick who are in receipt of Special Allowances. "vice" Batt O/C Edward Tracey, decd. Ceisteanna—Questions. Oral Answers. - Carlow Military Service Pension Claim. Mr. Hughes asked the Minister for Defence if he will say when Mr. Eugene Tracey, Fenagh, County Carlow, who made application for a pension under the Military Service Pensions Act may expect to hear of a decision in his case. Mr. Aiken (for the Minister for Defence): In the case of the application made under the Military Service Pensions Act, 1934, by Mr. Eugene Tracey, Fenagh, County Carlow, the finding of the referee is that on the evidence before him Mr. Tracey is not a person to whom the Act applies and he was informed accordingly. Mr. Tracey lodged an appeal for revision of the finding but the referee has not yet completed his investigations in the matter. In Strokestown proper there was a pretty lively unit - Tom Shevlin, Marty O'Connor, Sean Bermingham, Frank Treacy, Tom Mason and others. ...There in the cells we lingered on in hopes day after day and at least on one night we were assured everything was smooth sailing, when a crowd of storm troopers arrived with a fresh batch of prisoners - some new captures and sone old - including Marty O'Connor of Strokestown and Frank Treacy of Kiltrustan. They were parked in the other spare cells. When night came, Captain P. Flanagan, Lieutenant J. Hunt, Torn Dolan and I met and went on foot to Strokestown and met M.R. O'Connor (present Court Clerk), Frank Treacy (since dead) and Jimmie Beirne. Notes File relates to successful Service (1917-1921) Medal application. Service certified and medal issued 14 December 1954. Notes File relates to successful application for Service (1917-1921) Medal. Service certified and a duly awarded medal issued 9 June 1972. Associated file DP56156: relates to subject's application for Special Allowance under the Army Pensions Acts in respect of illness, disability or infirmity. Application rejected in 1976 on the grounds of means. File contains correspondence, memoranda, social welfare reports and means assessments. Notes: File relates to unsuccessful Service (1917-1921) Medal application. Claim not verified and application rejected (1972). Subject claimed membership of Fianna Éireann in 1920. The column consisted of Séamas Ó Cáinte, Mícheál Ó Coileáin, Criostóir de Barra, Pádraig Raghallaigh, Bearnárd Corcáin, Dan Mac aoidh, F. Plléimeann, Pádraig Ó Seanáin, Séamas Mac Murchú, Pádraig Ó Feargaill, Séamas Ó Maoilaoidh, Séan Mac Reámoinn agus Seán Treasaigh (of Mountbellew, Galway). The column was arrested on the 15th May 1923 in a house near Granabeg, Ballyknockan districk. Plunkett was killed and the rest were taken prisoner. Sir,—The caption—’Women continued to play an active role in the War of Independence’—under the photograph on page 41 of the last issue (Autumn 1996) is misleading on two counts. In the first place, it does not depict a War of Independence flying column but a Civil War one—the Third Battalion flying column (‘Plunkett’s Own’), No.2 (South Dublin) Brigade. Secondly, it is a ‘posed’ photograph: there is no evidence that any of the women depicted were ever ‘active’ and in the course of my research I have never come across references to women operating in any flying column during the Tan or Civil War. The photograph was taken most probably by May Mooney, one of the Mooney sisters, in the kitchen garden (now the car park) of Mooney’s Pub, Manor Kilbride (near Blessington), County Wicklow, on or about St Patrick’s Day, 1923. 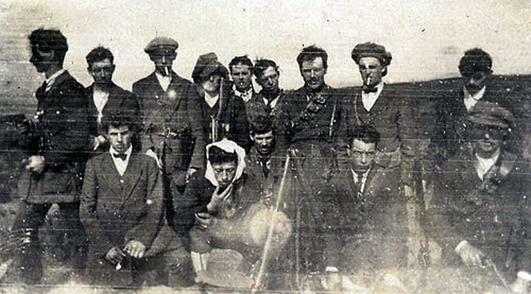 Included in the photograph (from left to right) are: (front row) Betty Mooney, Annie Mooney, Niall ‘Plunkett’ O’Boyle, Paddy Farrell, Peg Mooney; (centre row) Jim Redmond, Jim Treacy, Tom Heavey, Bride Mooney; (back row) Kay Mooney, Dan Whelan, Kit Barry, Bernard Corcoran, Paddy Reilly, Seamus McMorrow, Dan McGee, unknown. The column is well armed as evidenced by the Lee Enfield .303 rifles. Betty Mooney (not fully visible in the print used in the last issue) is holding Tom Heavey’s Thompson sub-machine gun. Annie and Peg Mooney each hold a Lee Enfield and Bride Mooney a revolver. Kay Mooney, a qualified nurse, who may have rendered medical assistance to the column from time to time is unarmed. Niall ‘Plunkett’ O’Boyle is wearing the uniform tunic of Sir Bryan Mahon, whose residence the column had burned down. Jim Redmond, Jim Treacy and Tom Heavey are holding what appears to be the tailgate of a small farmcart upon which is written in chalk: ‘No 3 Column Dublin 2’. 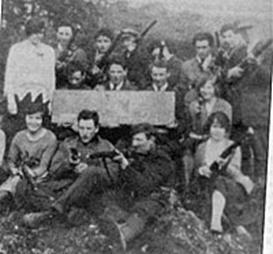 This West Wicklow-based IRA flying column, which operated from about October 1922 until its capture in May 1923, was a mixture of Northerners, Dubliners, West of Ireland men and locals, among them escapees from the Curragh and Newbridge internment camps. It operated under the jurisdiction of Third Battalion, No.2 (South Dublin) Brigade, under the command of Gerry Boland, later a Fianna Fáil Minister for Justice and known at the time as ‘Trotsky’, on account of his exposition of left-wing views. 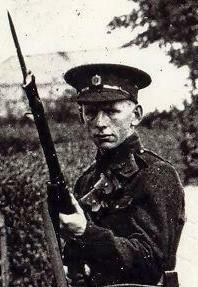 The column commander, Niall O’Boyle, had escaped with a number of others from Newbridge camp and had been sent to West Wicklow where, under the name ‘Sean Plunkett’, he gathered the local Volunteers under his command attacking Free State Army positions and burning local ‘big houses’, among them Mullaghboden House, residence of Sir Bryan Mahon, and Mauds of Tinode. Notes File relates to successful application for Service (1917-1921) Medal. Duly awarded medal issued 29 October 1953. Medal later deemed to have been duly awarded 26 August 1957. Associated file DP26865 : : File relates to successful application by subject for Special Allowance under the Army Pensions Act. Allowance awarded in 1968. File includes: medical certificate and reports, social welfare reports, signed statements regarding application for said allowance, reports regarding the means and level of income of subject and sanctions granting payment of allowance. After subject's death, both the balance of this allowance and a funeral grant were paid to his sister Miss Mary Treacy. Notes: File relates to successful application for Service (1917-1921) Medal. Medal issued 8 March 1948. Duly awarded certificate signed 26 September 1960. Subject claims to have worked as a postman and British civil servant while working for the secret service of the Irish Republican Army. Associated file DP23022 : File relates to unsuccessful application by subject for Special Allowance under the Army Pensions Acts. File includes: social welfare reports, signed statements regarding application for said allowance, reports regarding the means and level of income of subject and documentation relating to the non payment of allowance. Application rejected on the grounds of means. In the latter end of May  with Dan Grace, Battalion Adjutant, Danny Ryan, known as Danny Simon, Brigade Engineer at a. later date, Nicholas O'Dwyer, Brigade 0/C of Engineers, Jerry Treacy, Company Captain of Pallas, Jim Carthy and Mick Carthy of Doon, Jim Gorman and Paddy Costello of Holyford and others, I took part in an attack on Kimallock R.I.C. Barracks which had been planned by the Brigade Staff and Battalion Staff of the area. About this time I also received a request from Jerry Treacy, Nicker of the East Limerick Brigade to come to Nicker, Pallasgreen, to deal with the wife of a man named O'Connell who was suspected of giving information to the R.I.C. ...[June] 1920...Lieutenant William Allinson White...had effected the arrest of Jeremiah Treacy, the local company commandant. Treacy had been commandant of the Pallasgrean Company but on the night of 10 June, White spotted a bicycle outside Buckley’s house at Corelish, near Passasgrean. When Treacy emerged from the house, White held him up and searched him. The search uncovered a revolver and four rounds of ammunition. 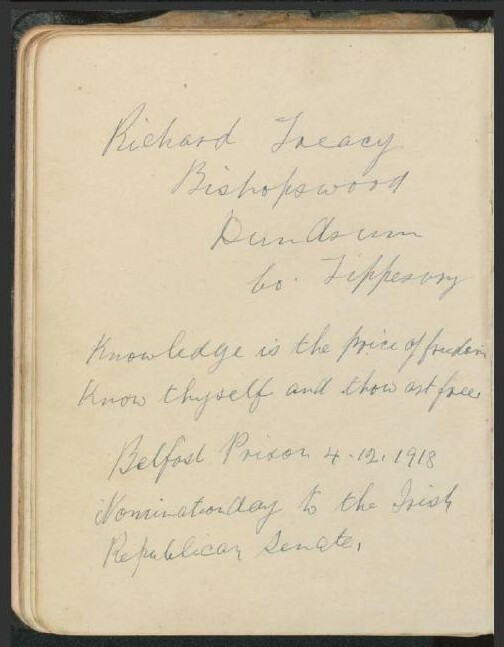 Treacy was subsequently sentenced to a prison term which he served in Liverpool (County 904/216 British Archives Kew). Joseph Tracey, civilian, of Bunavie, Co. Limerick, was tried by court-martial at Cork, on 23rd June, on charges of having a revolver and ammunition without a permit. He was found guilty and sentenced to eighteen months imprisonment with hard labour. § 11. Lieut.-Commander KENWORTHY asked the Chief Secretary of Ireland whether William Kane, Samuel King, Thomas Bramble, Samuel Fleming, and John Lappin, all Ulster Volunteers of Londonderry, were tried recently by special Crimes Court in Londonderry before Major Brett, resident magistrate, and Mr. R. Sparrow, resident magistrate, on a charge of carrying rifles and ammunition; whether they were found guilty and sentenced to a fine of £5 each; whether Joseph Trany [Joseph Tracy], of Bunavie, county Limerick, was tried by district court-martial at Cork on 23rd June, 1919, on a charge of having a revolver and ammunition; and whether he was found guilty and sentenced to 18 months' imprisonment with hard labour? § Sir H. GREENWOOD The prisoners referred to in the first part of the question pleaded guilty and were fined as stated, but I would point out that the hon. and gallant Member, while mentioning all the cases of Ulster Volunteers charged with carrying arms during the Derry riots, and implying that they were given preferential treatment, has omitted to mention that several persons of the opposite faction were arrested in exactly the same circumstances, were brought before the same Court, charged with the same offence, and received the same sentence. The circumstances in the case of James Tracy—not Joseph Trany, as mentioned in the question—were quite different. § Lieut. - Commander KENWORTHY Was not James Tracy punished in this way long before there were political murders or assassinations of police in Ireland, and does the right hon. Gentleman not think a better example should be made of men of all faiths and factions carrying rifles, in Londonderry? § Mr. C. PALMER Does the right hon. Gentleman not think it is quite natural that Ulster men should arm themselves against the dastardly assassinations of the Sinn Feiners? § Sir H. GREENWOOD With reference to the supplementary question put by the hon. and gallant Gentleman, I cannot, without notice, say when James Tracy was sentenced, but I am convinced that the sentence of 18 months' hard labour for what was in effect threatening the life of an officer was not too severe. § Lieut. - Commander KENWORTHY May I ask why these men of different faith in Londonderry are only fined for carrying rifles and ammunition, especially in view of the heavy loss of life in Londonderry, and whether the right hon. Gentleman is going to take possession of the rifles scattered all over that unhappy city? § Sir H. GREENWOOD The charge was that of carrying rifles and ammunition, and the sentence was given by a Resident Magistrate, and I cannot interfere with the sentence of any judicial officer in Ireland. § Lieut. - Commander KENWORTHY Is the right hon. Gentleman now going to take possession of these rifles scattered all over Londonderry? § Mr. SPEAKER The hon. and gallant Member must give notice of that. ...demand for political treatment...J. Treacy...Limerick. Reference: CO 904/216/4. Dublin Castle Records, File 428, 23 folios. Tried by Court Martial at Cork 23 June 1920. Tracy was found guilty and was sentenced to 18 months hard labour. Notes: File relates to successful Service (1917-1921) Medal application. Service certified and medal issued 16 July 1952. Medal later deemed to have been duly awarded . Associated file DP28006 : : File relates to successful application by subject for Special Allowance under the Army Pensions Act. Allowance awarded in 1956. File includes: medical certificate and report, social welfare reports, signed statements regarding application for said allowance, reports regarding the means and level of income of subject and sanctions granting payment of allowance. Subject claimed he was imprisoned in 1918 and again in 1919, and was later arrested in March 1921 and 'badly battered by Black and Tans'. Subject further claimed to have organised an I.R.A. Company in his area. Subject's date of baptism recorded as 19 June 1895, date of birth not disclosed. File includes a copy of the subject's death certificate. After subject's death, the balance of this allowance was paid to his brother Joseph Treacy. Notes File relates to successful application for Service (1917-1921) Medal. Service certified and a duly awarded medal issued 4 October 1956. Associated file DP25133 : : File relates to unsuccessful application by subject for Special Allowance under the Army Pensions Acts. File includes: social welfare reports, signed statements regarding application for said allowance, reports regarding the means and level of income of subject and documentation relating to the non payment of allowance. Application rejected in 1957 as subject was not found to be incapable of self support by reason of permanent infirmity. Notes: File relates to successful Service (1917-1921) Medal application. Medal later deemed to have been duly awarded. Duly awarded certificate signed 23 May 1969. Note states that John Joseph was named after his mother Nora White and his paternal name may have been O'Brien or White. A Sinn Féin supporter was John R. Treacy, a native of Youghal, County Cork, who taught in Limerick and Dublin before coming to Sligo in 1904. In Dublin, he was closely associated with William Rooney, the poet, and Arthur Griffith in the early days of the Sinn Fein movement, helping to edit the "United Irishman". He taught in Summerhill College and in the Technical School for 25 years. He had been involved with Griffith and William Rooney in Sinn Féin while in Dublin and was one of the “Apostles of Sinn Féin” in Sligo. In July 1918, he was under surveillance and in August 1918, he was arrested for reading the Sinn Féin manifesto and placed in Sligo prison. A week later he was moved to Galway. On September 24th at a court martial in Renmore Barracks Galway, Tracey was found guilty and sentenced to two years imprisonment. He was released at the beginning of October on medical advice. When he arrived at Sligo Station he was met by a large crowd of Sinn Féiners and escorted to his home. In December 1920, he was again arrested and at the end of January he was moved to Derry. In January 1921, he was moved from Derry jail to Ballykinlar Camp, Co. Down. In the camp he gave classes in Shorthand and Book-keeping Classes. In October 1921, after 3 weeks on parole after long internment he was released. During these times, his wife suffered greatly from the disturbances caused by the attentions of the authorities. He died in November 1929. Sympathy was extended to his widow and family, as well as his sister-in-law, Mrs Tracey, Catherine Street, of Youghal, and his nephew, nieces and cousins in that town. Sligo 1914-1921: A Chronicle of Conflict. By Michael Farry. John Tracey, of Sligo, 4 Nov 1921 Internment camps & prisons. 14 Oct 1921 John Tracey of Sligo was released from Internment 8-1-1921 in consideration of the serious illness of his wife, who is mentally affected. Sligo - Professor Treacy and the municipal technical schools, were searched by military and police. Mr. Treacy objected to allow a personal search, but he was forcibly held down by two constables while another went through his pockets. In no instance was anything incriminating discovered. Sligo Cemetery, Sligo Town, Co. Sligo, Ireland. Erected by, his friends and the Citizens of Sligo, (In the year of his office), of, Fraser Brown, (Mayor), as a token of public esteem. To the memory of, John R. Tracy, late prop. Summer Hill College, Sligo, who died, on the 28 day of Nov. 1929. John Treacy, 2/RO/102 Cashier Irish Command, 05 Feb 1921 Internment camps & prisons, cheque £2-10-0. Particulars: Accused was asked by police if he had a gun he said he had and immediately handed same over. The police gave the accused an excellent character and was always a good friend to them. (Men) John Treacy, Bishop St, Tuam (Sec. Com.) now U.S.A.
Tuam Company 1st Batt North Galwat Brigade I.R.A. Notes File relates to successful application for Service (1917-1921) Medal. Service certified and a duly awarded medal issued 18 November 1969. Truce Commemoration Medal issued 1975. File also includes material relating the payment of a funeral grant to subject's wife, Kathleen Treacy nee Wynne. Notes: File relates to successful Service (1917-1921) Medal application. Service certified and medal issued 14 December 1954. Medal later deemed to have been duly awarded. Duly awarded certificate signed 6 August 1969. Associated file DP48775: relates to subject's application for and award and payment of Special Allowance under the Army Pensions Acts in respect of illness or disability. Allowance awarded 1969. After subject’s death, both the balance of this allowance and a funeral grant were paid to his sister, Nancy McNamara [nee Tracey]. File includes applications, memoranda and correspondence, means assessments, and social welfare and medical reports. Notes File relates to initial successful application for Service (1917-1921) Medal. Medal issued 29 October 1953. Upon reinvestigation for a Spcial Allowance application subject's medal was held not to have been duly awarded (1965). Subject claimed membership of B (Bulgaden) Company, 4 Battalion, East Limerick Brigade I.R.A.. Associated file DP27357: relates to subject's application for Special Allowance under the Army Pensions Acts in respect of illness or disability. Application initally rejected in 1956 on the grounds that subject was not deemed to be incapable of self-support by reason of permanent infirmity. File contains correspondence, memoranda, social welfare reports and means assessments. List Of Persons Resident In County Limerick Who Are In Receipt Of Pensions Under The Military Service Pensions Act, 1934. 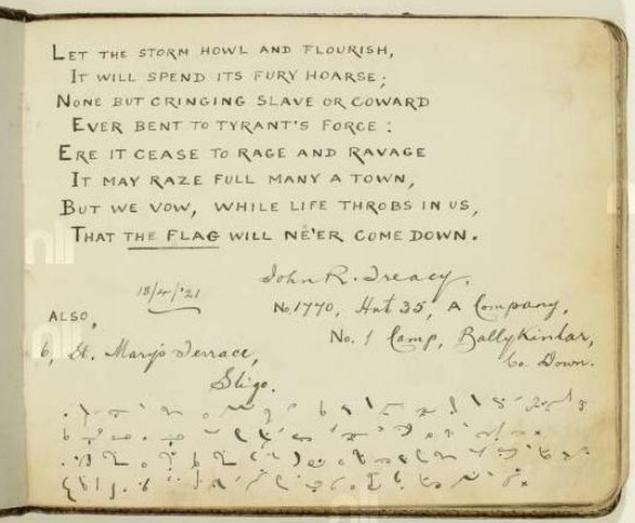 Messrs. J. Treacey, Roscrea; J. Day Templemore, with a ford car, were arrested at Toomevara on Sunday week by Dail troops. ...One of them, Sean Tracey, from Tipperary, who is an 87? year old veteran of the fight for independence, said, "We are thin on the ground now, but we are still able to pay our respects to The Chief." Notes File relates to successful Service (1917-1921) Medal application. Service certified and medal issued 30 December 1952. Medal later deemed to have been duly awarded. Duly awarded certificate signed 21 October 1957. Associated file DP28515: relates to subject's application for Special Allowance under the Army Pensions Acts in respect of illness or disability. Allowance awarded in 1957, and payments were later ceased in 1962. File contains correspondence, memoranda, social welfare reports and means assessments. Tom Treacy Kiltulla Kilkerrin in U.S.A.
Notes File relates to successful application for Service (1917-1921) Medal. Duly awarded medal issued 8 August 1961. Associated file DP25120 : File relates to successful application by subject for Special Allowance under the Army Pensions Act, in respect of ill health experienced by subject. Earlier applications for allowance refused, however an allowance was later granted. File includes: medical reports, social welfare reports, signed statements regarding application for said allowance, reports regarding the means and level of income of subject and sanctions granting payment of allowance. After subject's death, both the balance of this allowance and a funeral grant were paid to his next-of-kin. It was claimed that the subject was imprisoned in Galway Jail and later in the Curragh Camp, Kildare. 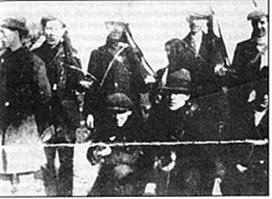 April 23rd, 1920 Following the arrest of John Dowd and Patrick Walsh, the following local volunteers were arrested namely, Thomas Stundon, Parknageragh, Joe Treacy, Ballymacaquim, John Leen, do, Cornelius Lyons, Laccabeg. They were questioned about the taking of the mailbag but all had to be later released as no evidence could be found against them. Patrick Walsh was the last released. Limerick Union Hospital (11 days) Limerick Asylum (6 months0 discharged as "Improved". Did not go to work until Sep 1923, came to Dublin to work (Marino Clontarf) worked only one day (Mr Kenny) then got a light job in Harcourt Road (Sawmill) 9 weeks and 2 days. Went back to Limerick and didn't do any work since. Small scar on vortex of head. Traumatic Neurasthenia. Awarded a Special Allowance from 7 November 1951. File relates to Joseph Tracey's unsuccessful application for a military service pension in respect of his claimed service with the Irish Volunteers and the IRA from 1 April 1916 and 30 September 1923. File (1P120) relates to Tracey's unsuccessful application for a wound pension or gratuity under the Army Pensions Acts in respect of injuries sustained by him while serving with the IRA. It is claimed that Tracey suffered from a nervous breakdown. Further claimed that Tracey was beaten by members of the British forces in Patrick Street, Limerick and that he spent six months in Limerick Mental Hospital. Applicant received an allowance from the White Cross Association. Reference made to an application for compensation under the Compensation (Personal Injuries) Committee. Also includes claimant's successful application for a Special Allowance. File contains: material concerning his successful application for a Service (1917-1921) Medal without Bar; Medical report on an ex-Irish Volunteer claiming disability in respect of service; medical report on Joseph Tracey; handwritten extract of birth certificate; social welfare reports; material relating to payment of balance of allowance to Limerick Health Authority. Notes File relates to successful Service (1917-1921) Medal application. Service certified and duly awarded medal issued 3 March 1958. Notes: Incomplete application for a Service (1917-1921) Medal. Medal not awarded. Notes File relates to successful Service (1917-1921) Medal application. Service certified and duly awarded medal issued 6 May 1977. Associated file DP56948: relates to subject's application for Special Allowance under the Army Pensions Acts in respect of illness, disability or infirmity. Allowance awarded in 1981. File contains correspondence, memoranda, social welfare reports and means assessments. Martin Treacey, Went to West of Ireland. Address unknown. You joined in 1917 at Ballydaly where you lived. It was 1.5 miles from Tullamore. You were a nurse by profession. You were living at home. You did not get married until 1925. Your mother assisted you. Your elder sister was married and living away from home. The three youngest siters were school-children. You had one brother in the Volunteers. Service periods between 1 April 1919 and 31 March 1923 during the War of Independence, the Truce Period and Civil War. Applicant also claimed unsuccessfully for service in the periods between 1 April 1917 and 31 March 1919 and between 31 March 1920 and 30 September 1923. Mary Anne-Treacy (née Meleady) had one brother Martin Meleady (MSP34REF18658) who was active with the IRA and served as Battalion Quartermaster. Sean McGuinness (MSP34REF4688) described the Meleady family home, which was situated about 1.5 miles from Tullamore, County Offaly, as a “rendezvous for the founders of the IRA movement in North Offaly as well as for the officers, staff and men carrying on the fight from 1916-24”. In the 1918-1919 period, it is stated on file that the applicant Mary-Anne Treacy nursed 1916 Easter Rising veteran Peadar Bracken (MSP34REF25453) for up to two years. As Captain of the Ballydaly Branch, 1 Battalion, 1 Offaly Brigade, Cumann na mBan, it is stated that the applicant took part in general Cumann na mBan activity in during the War of Independence (January 1919 – July 1921) including: sheltering IRA men on-the-run including Seamus Robinson, Sean Treacy (1D458),, Sean Hogan (MSP34REF375) and Dan Breen (MSP34REF171) for up to one month; making munitions; conveying arms; dispatch-work; bringing food to IRA prisoners in Maryborough Gaol (Portlaoise Prison), County Louth; filling bandoliers with fifty rounds ammunition for Volunteers before attack on Clara RIC Barracks (1920) and handing twenty guns over to Volunteers who were mobilised in expectation of ‘Black and Tan’ (RIC) reprisals following a shooting in Tullamore, County Offaly (1 November 1920). A trained nurse, Mary-Anne Treacy tended to injured IRA Volunteers such as Bartly Byrne (MSP34REF18550); Sean Robbins for month following his escape from Mountjoy Jail, Dublin and applicant’s brother Martin Meleady (MSP34REF18658) who was injured during an attack on Clara Barracks, County Offaly (1920). The applicant’s brother Martin Meleady (MSP34REF18658) wrote in a reference statement  that: “On one occasion, a dump was found near the house by a man who was not to be trusted. I had to get a car to take them away and by the time I got back, [my sister] had them taken to a safe place and helped Clarke, Brennan and myself to load them”. During the Truce period (July 1921 – June 1922), the applicant states helped provide food to an IRA training camp in Ballydaly, County Offaly for six months. Taking the anti-Treaty side in the Civil War (June 1922 – May 1923), the applicant states that she took part in similar activity. Mary-Anne Treacy married her husband in 1925. File includes signed handwritten and typed statements regarding subject's service from Michael Kilroy (Undated); P. Egan (Undated); Bartly Byrne (1940); Michael Gavin (1940); James Clarke (1940); Sean Robbins (1940); Sean McGuinness (1940); Martin Meleady (Undated); Peadar Bracken (1940); Michael Killeavey ; Michael Galvin  and Mary J Poland (1941). Representations were made on behalf of the subject by Nicholas Egan TD (1961) and Ber Cowen TD (1978). Also contains a typed summary and sworn statement made by the applicant before the Advisory Committee on 25 April 1941. Notes: File relates to unsuccessful Service (1917-1921) Medal application. Medal not awarded. Other addresses: St. Brendan's Home, Loughrea, Co. Galway. Subject Information: File relates to Michael Treacey's receipt of a military service pension in respect of his service with the Irish Volunteers during the week of 23 to 29 April 1916, his subsequent internment until December of that year, his service with the IRA during the War of Independence in 1920 and 1921 - claims to have participated in raid for supplies at Athenry Railway Station in 1920 and blocked roads during attacks on RIC barracks at Moyvilla and Bookeen - and with the National Army during the Civil War in 1922 and 1923 in counties Galway and Cork. Michael Treacey left the Defence Forces in March 1924 having served at the rank of Private. File contains: signed statements regarding claimant from Francis Curran and Sean Broderick T.D. ; handwritten notes of evidence given by subject before the Board of Assessors, Military Service Pensions Act, 1924; and material relating to administration of claimant's pension. Michael Treacy. Volunteer, Athenry Company, Galway Brigade, Irish Volunteers. Born in 1883 died on the 4th of October 1967, aged about 33 years old during the Rising. Fought at the Agricultural Station Athenry, Moyode and Limepark County Galway. He was arrested after the Rising and deported being released in December 1916. He fought during the War of Independence and participated in raids for supplies at Athenry Railway Station in 1920 and blocked roads during attacks on RIC barracks at Moyvilla and Bookeen. He served with the National Army during the Civil War in 1922 and 1923 in counties Galway and Cork. He left the Defence Forces in March 1924 having served at the rank of Private, Army Service Number 35156. 1925 Treacy, Michael, Ballinalee, Longford. 1 and 4 Battalions, Longford Brigade. Mick Treacy of Dublin GAA? Mick Treacy [Dublin GAA?] to Harry Bolland, 14 Oct. 1916 (paragraph in family letter). Treacy claimed to be 'in great form at "Drumcollogher" ' [Limerick]. Fitzpatrick, David (2004) Harry Boland's Irish Revolution. Cork University Press. Feb 9, 1923, Feb 13, 1923 & Feb 17, 1923 (IT) Armed Robbers. Dublin Men get "Cat" and Seven Years. Notes File relates to unsuccessful Service (1917-1921) Medal application. Service not established and medal not awarded (1962). Subject claimed membership of North Galway Brigade of the Irish Republican Army. Associated file DP33314: relates to subject's application for Special Allowance under the Army Pensions Acts in respect of illness, disability or infirmity. Application rejected as subject did not hold a duly awarded medal. File contains correspondence and memoranda. Notes File relates to unsuccessful Service (1917-1921) Medal application. Claim not verified and application rejected (1973). Subject claimed membership of the Irish Republican Army in Gowran, county Kilkenny. Notes File relates to successful Service (1917-1921) Medal application. Service certified and duly awarded medal issued 13 January 1960. Associated file DP32610: relates to subject's application for Special Allowance under the Army Pensions Acts. Allowance awarded 1960. “However it is believed that Collins was expected at the house of Cannon [Patrick] Tracey of Crookstown during his last visit (to Cork). The reason for the visit, it is said, was to make contact with intermediaries (for peace)…A stop at Crookstown would explain the seemingly inexplicably circuitous Bael na mBlath route back from Cork from Bandon which Collins took.” Reference: Garda Hickey articles Limerick Weekly Echo 26/8/1972 to 16/9/1972. 14 September 1927 Typescript copy of a letter from P. Treacy P.P., to the editor, Cork Examiner, referring to a recent speech by Canon Cohalan in Bandon, reported in the newspaper. Treacy, the parish priest of the Béal na mBláth district, supports Cohalan’s contention that de Valera was in the area the day before the death of Collins. ‘In the morning of the day of the murder he was seen superintending the arrangements, and about mid-day motored back to Ballyvourney’. 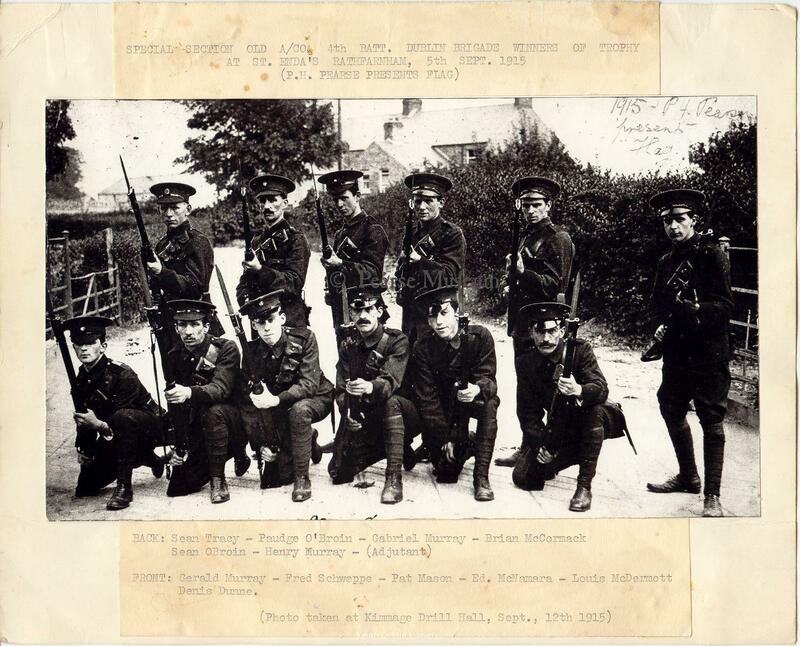 The Boherbue Company of the Irish Volunteers was started at a meeting held in Boherbue on 15th August, 1915. I had attended a meeting in Kanturk and I had invited Denis Lyons, John O'Connell, Jim Leonard and Paddy Tracey to come to a meeting in Boherbue. To Patrick Treacy, Kanturk, Co. Cork. 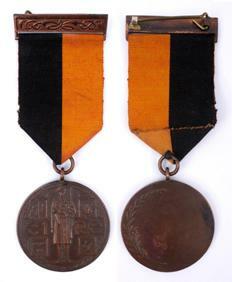 1939-46 Emergency Service medal with one bar, issued for Caomhnoiri Aitiula (Local Security Force) service. “A network was set up so that Broy could pass messages to Collins undetected and vice versa. At Kingsbridge Station there was Pat Treacy, a relation of Broy’s.” In 1918, Broy became Michael Collins main inside man within the British Intelligence. Dwyer, T. Ryle (2005) The Squad: And the Intelligence Operations of Michael Collins. Mercier Press, Dublin. ...Then I thought of a Sinn Féiner who was married to a first cousin of mine. His name was Patrick Tracy and he was employed as a clerk at Kingsbridge railway terminus. I had a talk with Tracy, and he agreed to transfer any information I wanted transferred. He also agreed that O'Hanrahan's shop was ideal for the purpose. information was to come back to me. From that on, every secret and confidential document, police code, etc. That came to my hands was sent, through Tracy and O'Hanrahan, to the Volunteer headquarters. I knew nothing at all at this time about Michael Collins. ...I gave Tracy a copy of the complete list on the Wednesday forty-eight hours before the arrests took place. I met him in a public house in Benburb St. I got Tracy to copy the particulars in his handwriting, destroyed mine there and then, and instructed Tracy that, in the usual manner, he should get O'Hanrahan to copy them and destroy his own handwriting. ...The following morning was a Saturday and in the ordinary way, Tracy would go off duty at 1 p.m. I went to his house in the afternoon and found that, as had frequently happened in the past, he had taken advantage of his free railway travelling facilities to go to his people-in-law's place in Monasterevan. Patrick Treacy, Kiltullagh, Glenamaddy, Co. Galway... I was born on the 29th October, 1899, at Kiltullagh, Glenamaddy, and educated at Kilkerrin Monastery, which was then, and is now, conducted by the Franciscan Brothers... Patrick Treacy, Capt., Glenamaddy Coy., Glenamaddy Battn. afterwards Adjt., Glenamaddy Battn. Position: Company Captain. Battalion Adjutant. Conor McNamara (2018) War and Revolution in the West of Ireland: Galway, 1913–1922. Irish Academic Press. Notes File relates to successful Service (1917-1921) Medal application. Service certified and a duly awarded medal issued on 12 June 1973. Notes File relates to unsuccessful Service (1917-1921) Medal application. Claim not verified and application rejected (1964). Subject claimed membership of the Irish Republican Army in county Carlow. Associated file DP39191: relates to subject's application for Special Allowance under the Army Pensions Acts in respect of illness, disability or infirmity. Application rejected in 1965 as subject did not hold a Service (1917-1921) Medal. Notes: File relates to an unsuccessful application for a Service (1917-1921) Medal. Service not established. No medal awarded. Subject claimed service with Kildare Brigade Fianna Éireann. Notes File relates to successful Service (1917-1921) Medal application. Service certified and medal issued 16 July 1952. Notes: File relates to successful Service (1917-1921) Medal application. Service certified and duly awarded medal issued 27 June 1964. Engineer Patk Tracey, Cloonmore, Knockroghery, Roscommon. Paddy Treacy was arrested in May 1916 but avoided jail at that time because of his youth. He was arrested again in May 1921 and interned in the Curragh until after the signing of the Treaty in 1921. In 1922 he immigrated to the USA. Notes: File relates to successful application for service (1917-1921) medal. Service certified and medal issued 1943. 516 Peter Treacy, 18 years, 5' 9¼", Fr hair, Bl eyes, Sallow complexion, Refused to be examined for marks on body, Refused to be weighed, born Drogheda, lived Drogheda, Father - Peter S/A, occupation Egg Packer, Single, R.C., Read & Write, committal 1/8/22, Detained in Military Custody, 1st Eastern Division, Drogheda, To be detained until further orders. Notes File relates to successful Service (1917-1921) Medal application. Service certified and medal issued 14 December 1954. Medal later deemed to have been duly awarded. Duly awarded certificate signed 24 November 1965. Associated file DP41904 : : File relates to successful application by subject for Special Allowance under the Army Pensions Act. Allowance awarded in 1965. File includes: social welfare reports, signed statements regarding application for said allowance, reports regarding the means and level of income of subject and sanctions granting payment of allowance. Now, at that class in Knockavilla, as time went on I got acquainted with several of the young men and women who played a great part in the struggle for freedom. There I got acquainted and became an intimate friend with Richard Treacy of Bishopswood, who became the Chairman of the Sinn Fein Club in the years that followed and was one of those who, in later years, defied the British Government by reading publicly the Proclamation of Dáil Eireann, and was imprisoned for a long time in Belfast Jail under very trying conditions, He was one of those who smashed through the roof of that jail when the fighting took place there and hoisted an improvised tricolour flag above the Belfast Jail at Crumlin Road. Another man I met at this class was Michael Sheehan who, like Richard Treacy, has gone to his eternal rest. He was a workman. Treacy was a farmer, but Michael Sheehan and his brother, Sean, were working with one of the local land holders and in the years that followed, they took a very active part in the struggle. At 9.30 on the morning after, i.e. 16th August, 1918, I was surprised by a visit of six R.I.C. men who arrested me while at breakfast. I was sent to Clonmel Jail, where I spent a month, and afterwards to Belfast Jail. Tried at Victoria Barracks, Cork, with my companions John Hassett of Barnane, Co. Tipperary, Seumas Mulcahy Lyons, Richard Treacy and others, we received a sentence of two years each for our faith in Ireland's cause and our uncompromising loyalty to her ancient claim to liberty. TRACY, Richard. In the spring of 1918, Richard Tracy was apprehended for delivering the Sinn Féin proclamation from Brownes' Steps, following Mass in Knockavilla. He supported Sinn Féin from the onset and, in 1912, had a visit to his house from Seán MacDiarmada, National Organiser. Richard was married and had young children when he was sent to prison in Belfast. One of his fellow inmates was Francis Philips of Cashel. Richard was avidly involved in Conradh na Gaelige. A company of the Irish National Volunteers was formed in Castlebar in 1913 which I joined; it was then run by a committee...In connection with the drilling of the Volunteers, we had four instructors all ex-N.C.O.s. of the Connaught Rangers but as they were all reservists they had to report to their unit when called up before the outbreak of the first world war in 1914. Two of them were outstanding as instructors their names were Tracy and Murtagh. My own local company - Balla - was exceptionally lucky in having an experienced sergeant of the Connaught Rangers as our instructor. His name was Tracey and he undoubtedly knew his job. He was a man of splendid physique and a decent type with a good national outlook. This man' a instruction to the Balla Company gave us a better groundwork than we otherwise would have had. The Great War of 1914 came. I was then in my fifteenth year. Local men began drilling. I did nod understand what it was all about but I joined the ranks and learned the military exercises. Our instructor was big Bob Treacy, ex-Sergeant Major of the Connaught Rangers. Later I knew I was a member of the Irish National Volunteers. After six months of this training it petered out and the younger men drifted away. Some, on the advice of the English so-called gentry who occupied the "big houses", joined the British Army. Rody Treacy, (b. 1891?) from Rapla [Ardcrony?, near Nenagh Co. Tipperary 1901 Census] [21 Britain St. Great, North City, Dublin 1911 Census], played GAA and handball for Faughs. He was arrested and tried in November 1920 At a District Court martial at Marlboro' Barracks, on possession at No.1 Millmount terrace, Drumcondra of a single round of revolver ammunition and with possession of a document containing statements the publication of which would be likely to cause disaffection, viz., "An Taglae" dated October 14th 1918. He declined to recognise the Court. His employer, had at one time occupied the room, testified that the ammunition may have been connected to a revolver he had surrender in 1916. In December 1920, he is reported as being an Irish prisoner in Carmarthen jail. In November 1921 he was back playing for the Faughs. Rody Tracey of 1 Millmount Ter Drumcondra, 27 Nov 1920 Courts martial of civilians, held Dublin, under GAA 27, sentenced 2 yrs, remitted 12 mos. 19 Oct 1920 file 2/3134/R.O. 9AA(d) R.O.IR 27R.O.IR. 29/11/20 I commute sentence to one of the finding on 2nd charge quashed impt for 6 months without HL and 3 months remitted by the GO CinC. On 31/12/20 letter sent to Wormwood Scrubbs. Particulars: At Connelly public house when accused was employed, 1 rd of 450 rev ammn in a washstand drawer, a copy of "An Toghlae" in a pocket of jacket in accused rooms. Notes: File relates to successful application for Service (1917-1921) Medal. Medal issued 29 April 1948. File also contains subject's wife's application for a Widow's Allowance. ...Inquiries made on Tuesday in Dundalk elicited the information that the three Sinn Fein prisoners there - Professor O'Neill, Michael Brennan and Samuel Tracey [of Louth Town] - are still on hunger-strike. They are all in hospital. The Square, Scariff, Co. Clare. File relates to successful application for Service (1917-1921) Medal. Service certified and medal issued 10 July 1953. Medal later held to have been duly awarded. Associated file DP24970: relates to subject's application for Special Allowance under the Army Pensions Acts in respect of illness or disability. Application rejected in 1954 on the grounds of means. File contains correspondence, memoranda and social welfare reports. This party was also the colour party at Rossa’s Funeral. Back Row L-R: Séan Tracy, Paudge O’Broin, Gabriel Murray, Brian McCormack, Séan O’Broin and Henry Murray (Adjutant). Front Row L-R: Gerald Murray, Fred Schweppe, Pat Mason, Ed McNamara, Louis McDermott and Denis Dunne. In the Autumn of 1912 when I was working in Magee's Grocery Store, Rathm1nes, with Sean Treacy, who afterwards became my brother-in-law, he asked me to join the I.R.B. I agreed and he brought me along to 41 Parnell Square, where I was initiated into the Fintan Lalor Circle by Sean McDermott, who was Centre at the time; Seamus O'Connor was secretary. Padraig Pearse was a member of the Circle. ...My brother-in-law, John Kiely, was killed when getting through the window [of the GPO] by a shot which was alleged to have been fired by a British officer from a window in the Metropole Hotel. J Tracey, 1 Dec 1920 Monthly raid & search reports 25th Brigade, James Gerard Connolly "D" of 7 Rathmines Terrace - Arrested man admitted he knew J. Tracey a wanted man he refused to devulge his address & was arrested. Nothing known of Donnolly. 2 Rathmines Terrace - J. Tracey has left. He works at Teranure & his address known by J. Connolly who was arrested when he refused to devulge it. J Tracey 10 Dec 1920 Daily raid reports, James Gerard Connolly of 7 Rathmines Terrace, shop assistant, lodged Wellington Barracks, This man works at Terenure under J. Tracey, who was to be arrested at No. 2 Rathmines Rd. He would not give Tracey's address. He seemed very frightened as admitted having Sinn Fein friends and sympathies. ...and Police Officer Sean Tracey represented the IRP [Irish Republican Police], Oriel House. ...Provisional Executive...Capt Sean Tracy, Q.M....Membership will be limited to men who were members of the IRA prior to the Anglo-Irish truce and who are not at present in any way engaged on either side of the struggle. Subject Information: File relates to John Tracey's receipt of a military service pension in respect of his service with the Irish Volunteers for part of the periods between 1 April 1916 and 31 March 1917 and with the IRA for part of the periods between 1 April 1920 and 11 July 1921. Applicant also claimed unsuccessfully for service in all other periods between 1 April 1916 and 30 June 1922. Following the 1916 Easter Rising John Tracey was interned until [September] of that year. During the War of Independence John Tracey served as a Company Lieutenant with the IRA and claims to have had charge of a number of arms dumps. He further claims that in March 1922, during the Truce Period, he joined the Criminal Investigation Department (CID) at Oriel House, resigned following the outbreak of the Civil War in June 1922 and took no further part in activities on either side of the conflict. File includes: standard form Referee R.15 showing details of subject's rank and unit strength as of 11 July 1921 from records supplied by the relevant Battalion Committee; typed transcript (5 pages) of sworn statement made by John Tracey on 27 May 1940 before the Advisory Committee, Military Service Pensions Act, 1934; and copy typed letter of 2 December 1940 from the Department of Defence to John Tracey forwarding acknowledgement form for receipt of Service Certificate to him and requesting its completion and return before payment of pension can be made - there is no further documentation on file after this date.